Melt butter. Saute garlic and onions together until tender. Remove from heat. 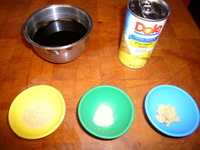 Add catsup, chili powder, mustard, and Teriyaki or soy sauce. Stir until well mixed. Add brown sugar. Stir while adding. 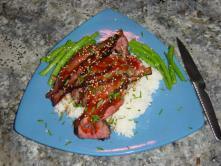 Marinated boneless short ribs in teriyaki marinade, and then brush this sauce on towards the end.